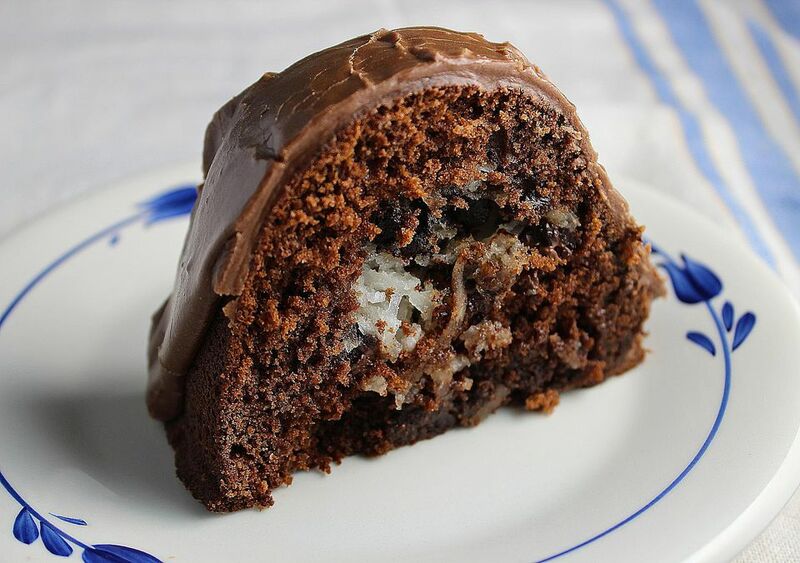 This delicious Chocolate Macaroon Bundt Cake is easy to make, despite the length of the recipe. Serve it for a special occasion and watch everybody enjoy it. It's the perfect recipe to make for a mid-morning snack, or for a bake sale. Preheat oven to 350 degrees F. Spray a 12" bundt pan (nonstick too) with nonstick baking spray containing flour and set aside. In a small bowl, beat egg white until foamy. Gradually beat in 1/4 cup sugar until stiff peaks form. Fold in coconut, 1 Tbsp. flour, 1 tsp. vanilla, and chocolate chips. Set aside. In a large bowl, place 2 cups flour, 1-1/4 cups sugar, brown sugar, cocoa, salt, baking soda, 2 tsp. vanilla, 3 eggs, 1 egg yolk, milk, butter, and sour cream. With same beaters, mix this batter on low until combined, then beat on medium high for 3 minutes. Spoon one-third of the cake batter into the prepared pan. Drop half of the coconut filling by teaspoons in the center of the batter, keeping the filling away from the edges of the pan. Cover filling with one-third of the remaining cake batter and top with rest of coconut filling. Carefully cover the coconut filling with the rest of the batter and spread evenly to cover. Bake the cake at 350 degrees F for 55-65 minutes until the cake is set, edges start pulling away from pan, and a toothpick inserted in the center of the cake comes out clean. Cool in pan for 10 minutes, then loosen edges and invert cake onto serving plate. Cool completely. In a medium saucepan, melt 1/4 cup butter. Add the powdered sugar, 2 Tbsp. cocoa powder, milk, and vanilla. Remove pan from heat, and beat with wire whisk until blended and creamy. Add more milk or powdered sugar, as needed, to reach desired spreading consistency. Spoon the glaze over the cake, letting it run down the sides. Store covered at room temperature.